On June 12, 1968, promoter Ed Francis' pro wrestling card at the Honolulu International Center (HIC) arena featured a United States title match, a Hawaiian championship match, and five other special events. 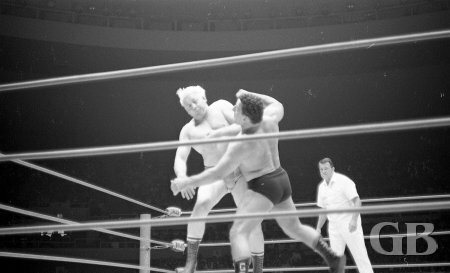 In the opening match, Neff Maiava wrestled to a draw with Masa Fujiwara. In other matches, Ripper Collins defeated Hahn Lee, Billy White Wolf subdued Killer Karl Kox, and Pedro Morales downed Pat Patterson. 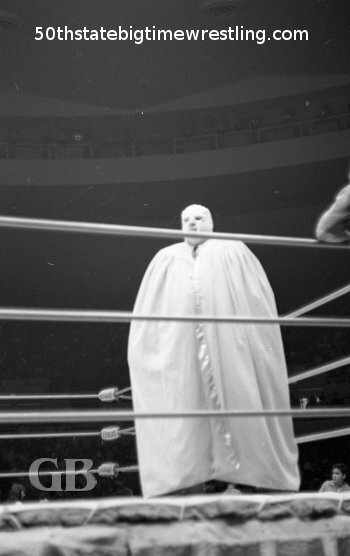 A masked Ripper Collins makes his ring appearance. 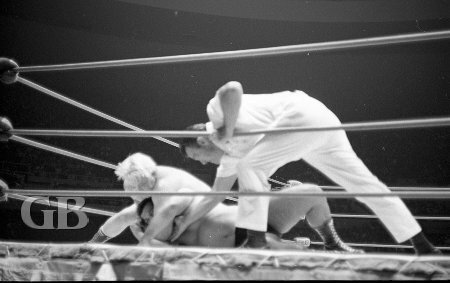 Hahn Lee attempts to unmask Ripper Collins while referee Wally Tsutsumi tries to intervene. A test of strength between Chief Billy White Wolf and Killer Karl Kox. White Wolf is declared the winner while a dejected Killer Karl Kox looks on. 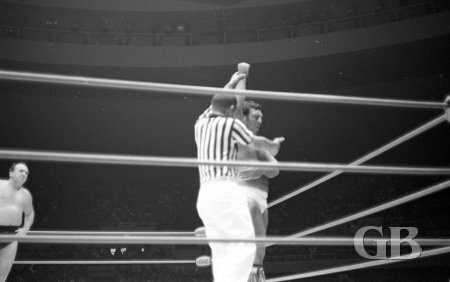 Pedro Morales about to whip Pat Patterson into the corner turnbuckles. 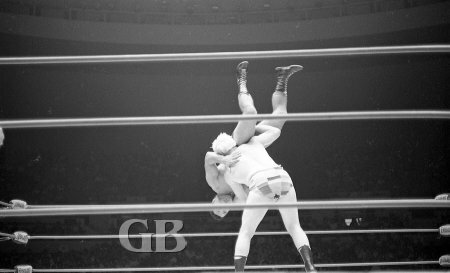 Pat Patterson turns things around and slams Pedro Morales. The Magnificent Maurice made his Honolulu debut by defeating The Missing Link in a one-fall match. A dandy looking Maurice struts down to the ring. 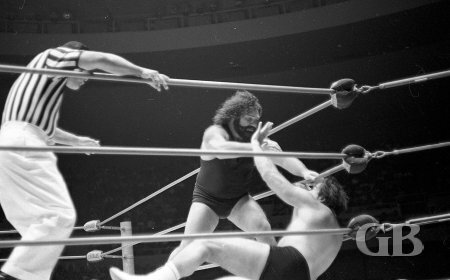 Pampero Firpo, AKA The Missing Link, attacks Maurice in the corner. 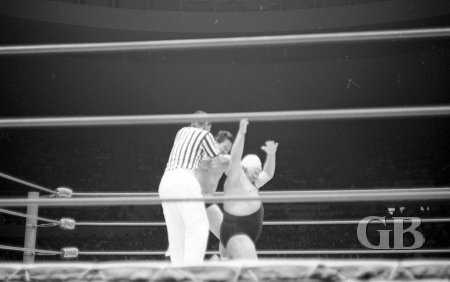 In the match for the Hawaiian championship, Curtis Iaukea and Peter Maivia battled to a draw, thus allowing Iaukea to retain his Hawaiian title. 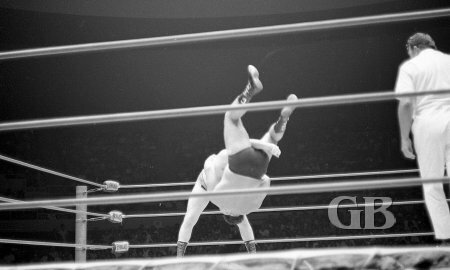 Peter Maivia about to flip Curtis Iaukea over with a side belly to belly suplex. Maivia body slams Curtis Iaukea. 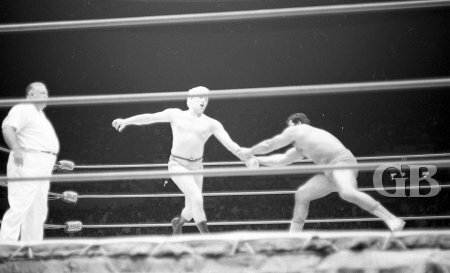 The main event had United States champion Ray Stevens giving Jim Hady a rematch for the title he lifted from Hady a month earlier. After both wrestlers had won a fall, Hady captured the title back from Stevens by winning the third and deciding fall with a back flip and press. 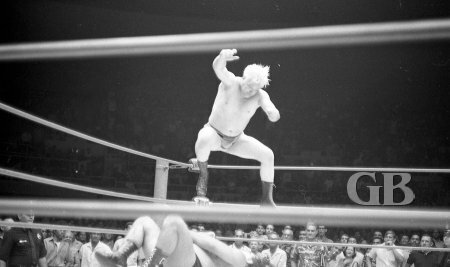 Ray Stevens delivers a knee drop onto a downed Jim Hady as the crowd rises to their feet. 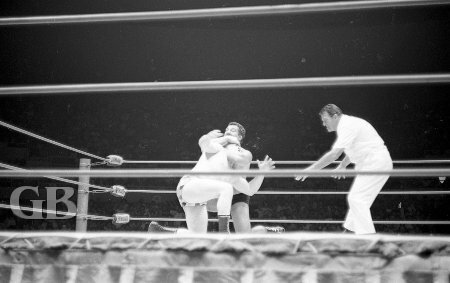 Referee Pete Peterson checks to see that Ray Stevens' head lock on Jim Hady is not a choke hold. 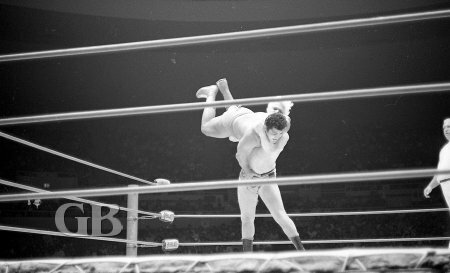 Ray Stevens gets thrown onto the top turnbuckle by Jim Hady. Stevens body slams Jim Hady. Another body slam, this time from a different angle. Jim Hady cinches his sleeper hold onto Ray Stevens. It's lights out time for Ray. Both men get slammed together in the middle of the ring.